Tongue based obstruction is a common finding in patients with snoring and obstructive sleep apnea syndrome. The tongue is composed of muscles and during sleep these muscles may relax and lose some of their tone. 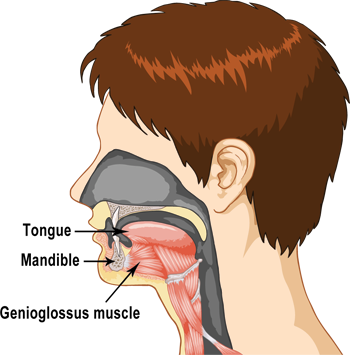 This can cause the tongue to collapse, fall backwards into the airway, and may obstruct the airway. This is why you may have noticed that snoring tends to be worse while you are lying on your back. Most people are unaware that they have tongue based obstruction and failure to recognize and properly treat it will result in persistent airway obstruction and snoring. Our protocol for diagnosing and treating snoring and sleep apnea includes a complete upper airway examination to determine if a patient has tongue based obstruction. This evaluation will also allow us to decide the best treatment option. One such option is a procedure called genioglossus advancement. The genioglossus is a muscle of the tongue. This procedure is designed to "pull" the genioglossus muscle forward to prevent it from falling back into the airway during sleep. Have you noticed that bed partners often ask snorers to lay on their side or chest to stop the snoring? These positions reduce the chance of the tongue falling backwards. This is the basic concept of this surgical technique: to treat your snoring and to allow you to sleep on your back again.